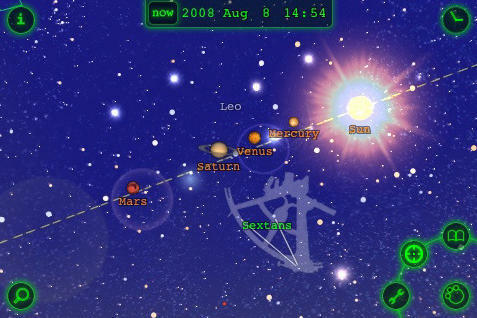 What it is: Star Walk is the official mobile astronomy guide for the International Year of Astronomy (IYA 2009), a $5 app for iPhone and iPod Touch that makes enjoyment of the celestial universe easier and possibly more enjoyable than anything outside a professional telescope. Vito Technology, developers of the app, recently updated this popular title with improved existing features and several new functions. The new version (1.5) has even more striking graphics, enhanced speed, more images and a greater depth of information than the release version, which has already spent more than 4 months in the Top 25 paid apps of iTunes’ App Store. Why it’s cool: Star Walk not only gives you a reliable guide to the present night sky based on your current location, it lets you change perspectives to locations thousands of miles away. It can also take you back in time to look at different events (such as eclipses) in the sky on specific dates; view lunar phases and learn about the discovery of constellations’ images and the reason for their shape. Use the super cool ‘infra-red’ night mode for easy outdoor stargazing without adding your device’s bright lighting to the ambient environment. The new version has been improved with more stars and constellations to look at, with better and more precise images, more reliability and more speed. The app makes stunning use of the iPhone accelerometer to change your perspective or point of view with just a swipe of the screen and provides zooming capabilities to allow you to travel in to deep space to find out the state of our knowledge of the outer universe. ♦ sounds on & off setting – but don’t turn them off; they are way cool! I’ve been playing with Star Walk for a couple weeks now and it’s definitely become a favorite app to use for stargazing as well as to show off some of my iPhone’s capabilities to friends and curious strangers. Where to get it: $5 at the App Store.